Duneswood offers a unique harmony between the beauty of our natural surroundings, the comforts of modern living and the nostalgic allure of a simpler time. 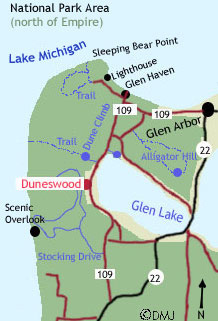 There is a new 'Tree Trail' in our woods and a new bike trail to Lake Michigan that goes right in front of Duneswood all the way to Glen Arbor and Empire! Guests are welcome to use the picnic tables, BBQ grills, lawn chairs and the fire circle. from Traverse City, MI: West on M-72 to Empire. At intersection of M-72 & M-22 turn right/north onto M-22. Continue about 2 miles. Look for the blue Pure Michigan sign for Duneswood Resort and brown park signs for Dune Climb. Turn left onto M-109. Resort is 3.0 miles north, on the left side. from Glen Arbor: Head due west on M-109 toward Glen Haven. Keep on M-109 (left at the stop sign) past D.H.Day Farm. Resort is on the right side 1/2 mi. beyond the Dune Climb. At intersection of M-72 & M-22 turn right/north onto M-22. Continue about 2 miles. Look for the blue Pure Michigan sign for Duneswood Resort and brown park signs for Dune Climb. Turn left onto M-109. Resort is 3.0 miles north, on the left side. Head southwest about 1 mile on M-22 S toward W Day Forest Rd. Short jog right toward Welch Rd. Turn left onto Welch Rd. Turn right/north onto M-109. Duneswood Resort will be on the left side.